Cycling is not just for those looking to compete in a cycling race. You too could also benefit from doing some ﻿cycling ﻿more often. The benefit is that you would end up staying fit all year around. You do not always have to get outdoors just to ride a bike, with the availability of the best bike trainers, you should be in a position to workout better than before. You simply have to mount the bike on the trainer and start working out. Instead of having a fan for generating the resistance, there is a magnetic flywheel to help in generating the resistance. The magnetic pull at the rear is what creates the resistance. You can get some trainers with the options of adjusting the resistance to your liking. These are the most affordable bike trainers you can buy today. They are made to generate resistance by using a circular fan. This means that you have to pedal to generate the resistance. The resistance might be limited in some cases. It can also be a bit noisy as compared to other types. They would normally have some fluid in a chamber that helps to create the resistance. They're often the most complex bike trainers to use. They do offer a road like feeling whenever using them for a workout. This could be something that many people want in a bike trainer. The rollers are the oldest t﻿﻿ype of ﻿﻿﻿﻿indoor bik﻿e trainers to have ever been made. 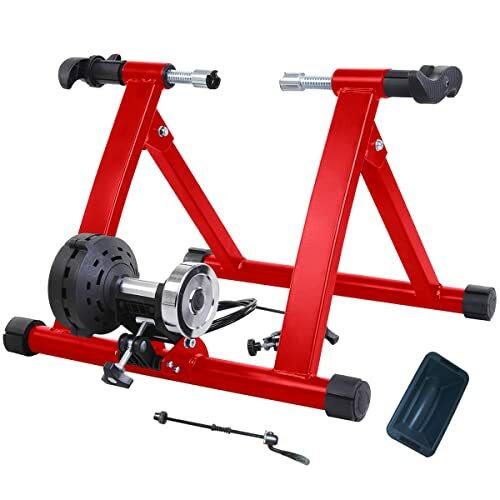 The bike will freely sit on three precision rollers in a frame. Whenever you turn the pedal, they also turn. The resistance can be varied with the size of the rollers. A smaller diameter offers more resistance and vice versa. If you are going to buy the best bike trainer, it is important that you choose one that delivers on your needs. Here are a few tips to help you make such a decision. The type of bike trainer. It can be fluid, magnetic, roller or wind; you have to choose one that can help you work out appropriately. Picking the budget is important, but do not always let it determine what to choose. It is always crucial to check out other models and their features before choosing them. Read a couple of reviews about the models before you can buy the model. The reviews would point out the strengths and weaknesses of a model each time you read one. Buy in a genuine store. It is the only way you can be sure that you will end up with the best model up to industry standards. For something that you would be using almost daily for working out, the best thing would be having one which is durable. The heavy duty construction is what will always attract more people to using the bike trainer for their workouts. The manufacturer also made it to have an extra wide frame that promotes stability. With more stability, you do not have to worry about falling off the bike trainer anytime soon. Talking of falling off, the bike trainer still has sturdy mounting cups. Such cups would help reduce cases of slippage whenever you mount the trainer. With no slipping, no injuries can be guaranteed. 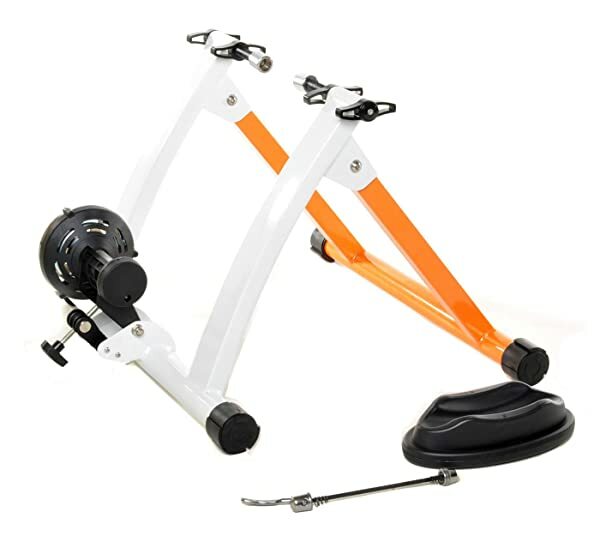 It is also an option to fold the bike trainer easily each time after you have used it. The progressive magnetic resistance is important for those people looking to workout even more on the hard resistance. 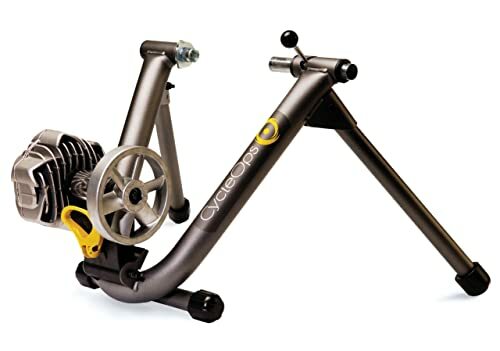 This is quite a versatile indoor bicycle trainer you will ever need for training most of the time. It is made to be leak-proof drive system and an automatic resistance changing capability. You can be sure that the more you use it, the more you can end up working out better. Whenever you are on the wheel, it is made to help the user feel, as it is the real road. That realistic feel helps more people to buy such type of best bike trainers. Just like other types of bike trainers, you would only feel comfortable if the trainer feels sturdy and it will not easily make you fall. It offers the right comfort you get whenever you are working out on this model. It is made to be extra stable even for those people who like riding while standing up. The manufacturer offers incentives such as unconditional lifetime warranty. Not many companies would give you such type of warranty for their products. There should be no reason why you are not working out on your bike with such type of bike trainers available. The model is designed to offer multiple features important for those looking for a great bike trainer. To begin with what makes it a great model, you get the heavy duty steel frame for an impressive amount of durability. It is often crucial to opt for such a model as it gives you the best durability you would need to keep on working out for a long time. It's not just the durability, additional features such as the 330 pounds as loading capacity should make it among the top models on the market today. It should be easy to adjust the magnetic resistance to a level that you like. It has made many people to opt for it as they can choose a resistance and speed suitable to them. The model can easily fit 26” to 28” and additional 700C different sizes of the wheel. If you are done with the workout, you could simply fold it for easy storage. The model is made of ultra-quiet technology so that you can enjoy working out indoors even if there is a baby sleeping in the house. As soon as you start riding, the magnetic resistance quickly builds up for you to feel as it is a real road. You could also increase the resistance of the bike trainer by shifting the gears of the bike. The model is also extremely portable so that you can move it from one place to another with ease for training. It is among the most stable stands you can ever get on the market. You would be happy to have a model knowing that you do not have to buy another one anytime soon. The model is designed to have extra wide legs that ensures to get that impressive stability each time you get on it to workout. The model is also extra durable thanks to the material used to make it. These fine materials have proven to be the best for many years now since the model has been in production. You will ultimately fall in love with this model thanks to its road-like feel each time you get on it. The resistance unit is encased in the hydraulic fluid thus is called the fluid trainer. The fluid trainer is different from the magnetic trainer as it can make it harder to pedal. This is something that many people would want for the best resistance. You can easily change the resistance level so that it can suit you correctly the way you want. The experience with the resistance is just unbelievable. You can vary it from 20 watts to about 725 watts. All that can be done by using the gearing or cadence function. With the impressive cooling mechanism added to it, it should be able to keep the model providing the right resistance for many years to come. It takes one-step at a time if you want to get fit. You can now opt for the best bike trainer from the list above. You will always have an easy time working out even during the winter period. There is no doubt that you will love it each time you climb on the bike and ride your bike without having to face the cold outside.